Frequency converter FC5-29M is a measurement instrument which is designed for spectrum conversion of 75 - 170 GHz to 1 MHz ÷ 2,6 GHz range and automatic frequency measurement of sinusoidal signals. When combined with the 1 MHz - 3,0 GHz spectrum analyzer, FC5-29M can be used for examination of the continuous and periodically repeating pulse signals. The instrument is meant to be used for measurement of various signal sources, radio-transmitting instruments, synthesizers, frequency converters, measurement generators and also for adjustment and verification of various radio-transmitting or communication instruments in laboratory and workshop conditions. Input signal frequency range from 75 GHz to 170 GHz is being covered by two subranges, which boundary frequencies are defined by mixers' signal input waveguide channels. Heterodyne (LO) input mixer frequency range from 16,5 to 31,0 GHz. Mixer output intermediate frequency range from 1,0 MHz to 3 GHz. Mixer output resistance 50 Ohm. 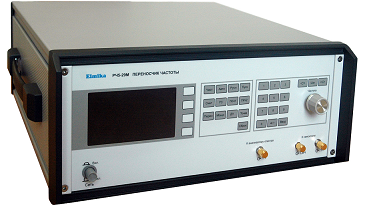 The instrument provides automatic input sinusoidal frequency measurement at power levels from 1μW to 1 mW. Reference generator relative error not higher than 5·10-8. Fmeas - measured input signal frequency. δFrg - reference generator frequency relative error. P - Frequency meter resolution (Hz). Embedded frequency synthesizer provides sinusoidal signal in the frequency range of 16,5 to 31,0 GHz and power of no less than 10mW (+10 dBm) at LO output of the instrument. Minimum frequency changing step at LO output of the instrument is 1 Hz. Frequency changing period from one frequency to any other within the operation frequency range at LO output of the instrument in not more than 100 μs. no more than -100 dBc/Hz at 100 kHz frequency offset. Spectral density of instrument self noise subjected to the input is no more than 3·10 -12 W/kHz in full operation frequency range. Instrument relative interference level caused by third-order intermodulation distortions is no more than -40 dB when two sinusoidal signals of equal amplitude with the level of 1 μW and the 100 MHz frequency offset between them within the operation frequency range are subjected to the input. The instrument power supply voltage 220±22 V with 50±1 Hz frequency and harmonics level not higher than 5%. The instrument provides its technical characteristics after 30 minutes period of warm-up. It is possible to use the instrument for evaluating measurements after 5 minutes of turning it on, but in this case, the parameters of the instrument are not guaranteed. The instrument allows continuous operation in working conditions for no less than 20 hours with provision of its technical characteristics. Note: continuous working time does not include the operation mode setting period. Instrument power consumption is not higher than 85V·A. Microwave frequency radiation level produced by the instrument is not higher than 5·10 -5 W/m2 at 1 meter distance from the instrument. The instrument can be controlled remotely through GBIP parallel interface in accordance with IEEE 488.1 standard (GOST 26.003-80).